California's transportation system is complex and dynamic. Although known for its car culture and extensive network of freeways and roads, the state also has a vast array of rail, sea, and air transport. Several subway, light rail, and commuter rail networks are found in many of the state's largest population centers. In addition, with the state's location on the West Coast of the United States, several important ports in California handle freight shipments from the Pacific Rim and beyond. A number of airports are also spread out across the state, ranging from small general aviation airports to large international hubs like Los Angeles International Airport and San Francisco International Airport. However, in a state with over 39 million people, rapid population expansion, and diverse terrain and weather, that system is under pressure to stay ahead of population growth and transportation needs. California's vast terrain is connected by an extensive system of freeways, expressways, and highways, all maintained by the California Department of Transportation (Caltrans) and patrolled by the California Highway Patrol (CHP), except for the numbered expressways in Santa Clara County which were built and maintained by the county itself. 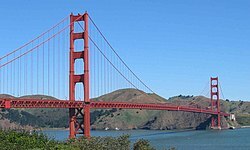 The main north-south arteries are U.S. Route 101 (US 101), which travels close to the coast from Downtown Los Angeles, across the Golden Gate Bridge, and to the Oregon state line, and Interstate 5 (I-5), which travels inland from the Mexico–United States border to the Oregon state line, effectively bisecting the entire state. In addition, a major north-south artery is State Route 99 (SR 99), which travels from near Bakersfield to near Red Bluff; SR 99 is largely parallel to I-5, and connects the Central Valley cities not connected by the Interstate. The state's freeway network has expanded ever since the Arroyo Seco Parkway, the first freeway in the Western United States,  connecting Los Angeles and Pasadena, opened in 1940. However, the state is not immune to freeway revolts, such as those that have prevented a freeway in San Francisco between the Golden Gate Bridge and the San Francisco–Oakland Bay Bridge, and an expansion of I-710 through South Pasadena. Almost all California highways are non-toll roads, including several major non-toll bridges in Los Angeles, Sacramento, and San Diego. However, there are four toll roads in Southern California, and eight toll bridges in the San Francisco Bay Area (including the state's most famous highway bridge, the Golden Gate Bridge). These toll facilities, along with several high-occupancy toll lanes, use the statewide electronic toll collection system known as FasTrak. Interstate 5: Bisects the state from the Mexican border to Oregon, linking the major cities of San Diego, Santa Ana, Los Angeles, Stockton, Sacramento, and Redding. Interstate 8: Travels east from San Diego to the Imperial Valley before crossing into Arizona west of Yuma. Interstate 10: Travels east from Santa Monica through Los Angeles, San Bernardino, and the Coachella Valley to Arizona. Interstate 15: Originating from San Diego, serves as the major route from Southern California to Las Vegas, Nevada. Interstate 40: Travels east from Barstow across the Mojave Desert to Needles before entering into Arizona. 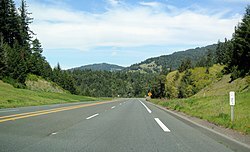 Interstate 80: Travels northeast from San Francisco through Sacramento and over the Sierra Nevada mountain range before crossing into Nevada west of Reno. US 6: Travels from Bishop east to Central Nevada. US 50: Heads east from the Sacramento area through the South Lake Tahoe area before crossing into Nevada en route to Carson City. US 97: Serves as the primary connection from the City of Weed to Klamath Falls, Oregon. US 101: The primary north-south U.S. Highway in California, connecting Los Angeles with the Central Coast, the San Francisco Bay, and the North Coast. US 199: Serves as the primary connection from the Crescent City area to Grants Pass, Oregon. US 395: A major north-south route in the eastern areas of the state, connecting the Mojave Desert with the Owens Valley and the Eastern Sierra Nevada. The route then clips into Nevada to pass through Carson City and Reno, before returning to California to serve the Honey Lake and Modoc Plateau areas. California still uses an older, cut-out version of the U.S. Route shield instead of the current design used in the other U.S. states, printed on a square blank with a black background. State Route 1: Runs along most of the Pacific coastline from Dana Point north to Leggett. It links numerous coastal settlements, beaches, parks, and other attractions in the Greater Los Angeles Area, the Central Coast, the San Francisco Bay Area, and the North Coast. State Route 41: Runs northeast, connecting the Central Coast with the central San Joaquin Valley, Fresno, and Yosemite National Park. State Route 46: Heads east from the Central Coast to the southern San Joaquin Valley near the vicinity of Bakersfield. State Route 49: Known as the Gold Country Highway, SR 49 links many historic mining communities of the California Gold Rush. State Route 58: Although the western segment of SR 58 is a winding mountain road connecting the Central Coast to the southern San Joaquin Valley, its eastern segment is a major artery linking Bakersfield with the Mojave Desert and Barstow. State Route 99: Serves as a major north-south artery in the California Central Valley, linking major cities such as Bakersfield, Visalia, Fresno, Madera, Merced, Modesto, Stockton, Sacramento, Yuba City, and Chico. State Route 152: Heads east from the Monterey Bay Area to the Santa Clara Valley and the Central Valley. State Route 299: Runs east across the northern part of the state from the Eureka area to Redding and Alturas. County routes in California are controlled and maintained by the respective counties in which they reside, but are normally patrolled by the California Highway Patrol like any other state highway. Each county route is prefixed with a letter, depending on the region of the state (e.g. G2). Routes with letters A, B, and D are in the region of Northern California; letters E, G, and J are in Central California; and N, R, and S are in Southern California. County routes can range from two-lane roads to the full expressways found in Santa Clara County. Altamont Corridor Express Commuter rail 1 The Altamont Commuter Express, also known as ACE, runs from San Jose northeast to Stockton, providing service from the Silicon Valley to Eastern Alameda County and San Joaquin County. Bay Area Rapid Transit Heavy rail 6 Bay Area Rapid Transit (BART) operates in the San Francisco Bay Area, connecting San Francisco with cities in the East Bay and suburbs in northern San Mateo County. COASTER Commuter rail 1 The San Diego Coast Express Rail (COASTER) operates in the central and northern coastal regions of San Diego County, running from San Diego north to Oceanside. Metro Rail Heavy and light rail 6 Metro Rail is an integrated subway and light rail system serving Los Angeles County. Metrolink Commuter rail 7 Metrolink serves Los Angeles and the surrounding area of Southern California, connecting Los Angeles, San Diego, Orange, Riverside, San Bernardino and Ventura Counties. Muni Metro Premetro, light rail 6 Muni Metro is a premetro/light rail system connecting various neighborhoods and districts of San Francisco. Sacramento RT Light Rail Light rail 3 The Sacramento Regional Transit District (RT) light rail system serves Sacramento and vicinity. San Diego Trolley Light rail 4 The San Diego Trolley serves the metropolitan area of San Diego. San Francisco cable car system Streetcar 3 The world's last manually operated cable car system continues to operate in northeast San Francisco, but the system's small service area and premium fares for single rides currently make the cable cars used more as a tourist attraction. Sonoma–Marin Area Rail Transit Commuter rail 1 Sonoma–Marin Area Rail Transit (SMART) runs through Sonoma and Marin counties. SPRINTER Light rail 1 The SPRINTER operates in north region of San Diego County, running from Oceanside east to Escondido. VTA Light Rail Light Rail 3 The Santa Clara Valley Transportation Authority (VTA) Light Rail system serves San Jose and its suburbs in the Silicon Valley. Intercity rail travel is provided by Amtrak. Additional rail funding is provided by the California Department of Transportation to operate Amtrak California which has the three busiest intercity rail lines in the US outside the Northeast Corridor: the Capitol Corridor connects the San Francisco Bay Area to Sacramento; the Pacific Surfliner runs along the coast of Southern California from San Diego to San Luis Obispo; and the San Joaquin connects the major cities of the Central Valley. National Amtrak lines include the California Zephyr from Emeryville to Chicago, Illinois; the Coast Starlight from Los Angeles to Seattle, Washington; the Southwest Chief and the Texas Eagle from Los Angeles to Chicago; and the Sunset Limited from Los Angeles to New Orleans, Louisiana. Local transit service is found in every county, from Los Angeles to Alpine County. Some local bus transit agencies like the San Francisco Muni and the Orange County Transportation Authority primarily only serve a specific city or county, while other agencies like AC Transit in the San Francisco Bay Area and the San Diego Metropolitan Transit System serve a specific region regardless of city or county borders. Intercity bus travel is provided by Greyhound and Amtrak Thruway Motorcoach. Major transit hubs that serve multiple bus and rail systems include Los Angeles Union Station, San Diego Union Station, San Jose Diridon Station, and Sacramento Station. Many of the state's local public transportation systems are bicycle accessible. Numerous buses are equipped with bicycle racks at the front of the vehicle for the attachment of approximately two bicycles. Several rail systems such as the Metro Rail and BART also allow riders to carry bikes onto the trains during certain hours of the day. San Diego, Oakland, John Wayne/Orange County, Sacramento, and San Jose are also among the 50 busiest airports in the United States. In total, there are about a dozen important commercial airports and many more general aviation airports throughout the state's 58 counties. California also has several important seaports. The giant seaport complex formed by the Port of Los Angeles and the Port of Long Beach in Southern California is the largest in the country and responsible for handling about a fourth of all container cargo traffic in the United States. The Port of Oakland handles most of the ocean containers passing through Northern California. The Port of Redwood City, the Port of Richmond, and the Port of San Diego are also significant ports for freight shipments. The Port of Sacramento and the Port of Stockton are two major inland deepwater ports located in the Central Valley, and thus only accessible via the Sacramento–San Joaquin River Delta. Instead of dredging the Sacramento River, the Sacramento Deep Water Ship Channel was built in 1963 to accommodate large ships traveling from the delta to Sacramento. Numerous local harbors are spread out across the Pacific Coast, San Francisco Bay, San Diego Bay, and the Sacramento – San Joaquin River Delta for commercial fishing or recreational use. A regularly recurring issue in California politics is whether the state should continue to aggressively expand its freeway network or concentrate on improving mass transit networks in urban areas. BART, LA Metro Rail, and several other public transportation systems have expansion plans either currently under construction or in the planning stages. Several HOT lanes across the state are also either currently under construction or in the planning stages. Reloadable contactless smart card systems, allowing electronic fare payments on various public transportation systems, have been introduced since 2007, such as the Clipper Card in the San Francisco Bay Area, the Compass Card in San Diego County, and the Transit Access Pass in Los Angeles County. ^ "California DMV Statistics - January to December 2010" (PDF). Archived from the original (PDF) on 2011-04-29. Retrieved 2012-02-25. ^ "A bridge too far gone". The Economist. 2007-08-09. ^ "Interstate 2000: Improvement for the Next Millenium". www.publicpurpose.com. ^ Pool, Bob (June 25, 1010). "Pasadena Freeway getting a new look and a new name". Los Angeles Times. Retrieved August 28, 2011. ^ "Caltrans Highway Design Manual". Retrieved 2012-02-25. ^ "Asia Pacific airports move up the ranks in 2011, with Beijing this year to overtake Atlanta". CAPA Centre for Aviation. 2012-04-17. Retrieved 2012-05-08. ^ "City of Avalon - FAQ". Archived from the original on 2011-07-08. Retrieved 2011-09-01. ^ Vardi, Nathan (2011-02-22). "America's Worst Commutes". Forbes. Retrieved 2011-09-05. ^ Michael Martinez (July 19, 2012). "Governor signs law to make California home to nation's first truly high-speed rail". CNN. Retrieved 3 September 2012. ^ "California High-Speed Rail Program Revised 2012 Business Plan" (PDF). California High Speed Rail Authority. Archived from the original (PDF) on November 12, 2012. Retrieved September 3, 2012.